Unequal Childhoods 2 Edition Class does make a difference in the lives and futures of American children. Drawing on in-depth observations of black and white middle-class, working-class, and poor families, Unequal Childhoods explores this fact, offering a picture of childhood today. Here are the frenetic families managing their children's hectic schedules of "leisure" activities; and here are families with plenty of time but little economic security. Lareau shows how middle-class parents, whether black or white, engage in a process of "concerted cultivation" designed to draw out children's talents and skills, while working-class and poor families rely on "the accomplishment of natural growth," in which a child's development unfolds spontaneously--as long as basic comfort, food, and shelter are provided. Each of these approaches to childrearing brings its own benefits and its own drawbacks. 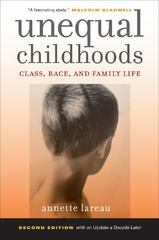 In identifying and analyzing differences between the two, Lareau demonstrates the power, and limits, of social class in shaping the lives of America's children.The first edition of Unequal Childhoods was an instant classic, portraying in riveting detail the unexpected ways in which social class influences parenting in white and African American families. A decade later, Annette Lareau has revisited the same families and interviewed the original subjects to examine the impact of social class in the transition to adulthood.